1. Traffic along Mandaluyong will be re-routed to give way to an Iglesia ni Cristo Medical Mission. 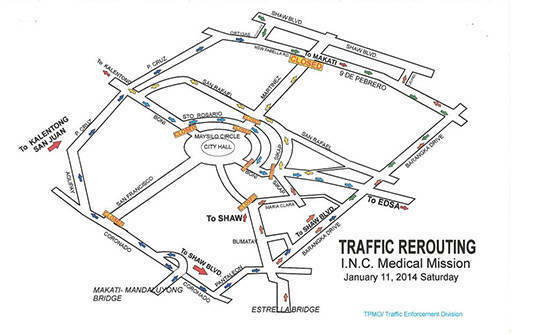 In local Metro Manila traffic news update, be advised that a section of Mandaluyong will be closed off on Saturday (January 11, 2014) in order to give way to an Iglesia ni Cristo Medical Mission. Click on the link for a larger view of the map. 2. The UP Diliman University Council voted not to endorse the proposal to move the start of classes to August. The council stated that more studies need to be done in order to gauge the impact of the new calendar year, claiming that there is no compelling argument to make the change. The six-month break is proving to be a very compelling argument for some. Don’t give in to temptation. This is what we found when we Googled David Tan. Walang kinalaman sa kanin, pero may ulam. 3. 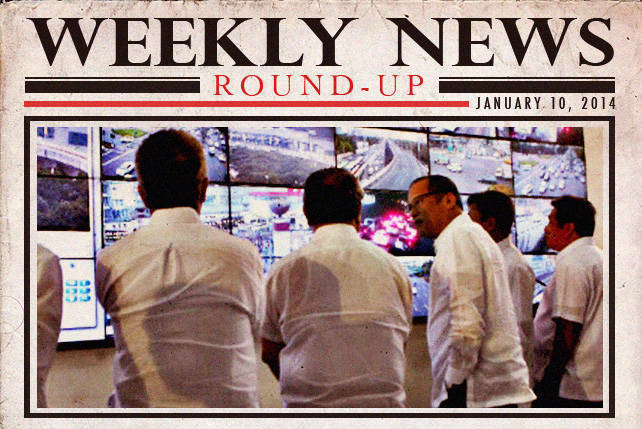 Alleged smuggling lord David Tan is probably fictional, said Atty. Argee Gueverra. 4. Lawmakers express support to probe on increase in SSS and Philhealth contribution rates. 5. 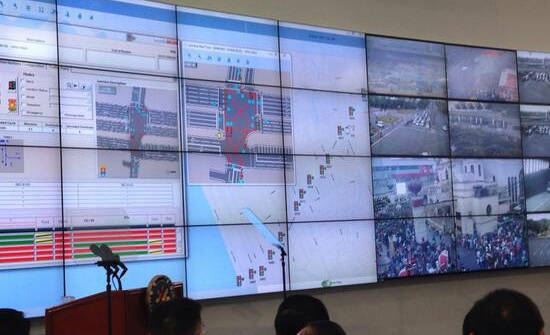 MMDA launches Hermes, a new high-tech traffic monitoring system. 6. Senator Juan Ponce Enrile has filed his counter-affidavit, claiming that he has nothing to do with the PDAF scam. In pork barrel scam news, Senator Juan Ponce Enrile has formally denied any connections with Janet Lim Napoles. He’s old enough to forget certain things. You have to admit that. 7. COA has found irregularities in the entries for the controversial Conditional Cash Transfer program. 8. Korina Sanchez goes back to school. After her tiff with Anderson Cooper, Korina Sanchez figured she needed to go back to school and learn a few things about journalism again. Let’s not make fun of her for doing the right thing. 9. A lot of devotees attended the Feast of the Black Nazarene. Incidents of injury did not deter people from flocking to show their devotion to the Black Nazarene. A man jumped off the bridge and barriers were toppled over, disrupting a mass in Luneta where Cardinal Tagle was doing his sermon. Atheists will quietly grumble about this event. 10. Senator Nancy Binay said that the Department of Health should not blame the Yolanda survivors for the measles outbreak. More about what’s happening in the post-Yolanda operations on Monday. See you next week, Spotters!